Chemical leaking from thousands of discarded cigarette butts is causing harm to the environment, according to the World Health Organisation (WHO). A joint report issued by United Nations Development Programme (UNDP)-WHO on the Occasion of World No Tobacco Day today (May 31) makes the case that tobacco control can no longer be seen only as a health issue. The theme for this year is "Tobacco - a threat to development." Despite a fine of Dh500, volunteers collect thousands of kilos of cigarette waste around Dubai each time a clean-up campaign is carried out. Recently, the Dubai Municipality gathered 30kg of cigarette waste from Shaikh Zayed road in one day. The waste management department at the municipality has now bought 40 new devices to gather cigarette butts and small-sized waste off corners hard to be reached by manual cleaning. Yaqub Al Ali, head of specialised cleaning section at the waste management department, said that the department purchased modern equipment for small-scale waste. "Cigarette butts are mostly found on by traffic lights, exits of metro stations and bus stations," he added. He urged the public to avoid throwing cigarette butts on the road to avoid fines. According to a report published on a blog by the UNDP, each year, 4.5 trillion cigarette butts are littered worldwide, by far the most littered item, with a significant percentage finding their way into our oceans and onto our shores. The problem is only likely to get worse, particularly as smoking rates continue to escalate in many low and middle-income countries. Not only being unpleasant aesthetically, cigarette filters are comprised of thousands of chemical ingredients, including arsenic, lead, nicotine and ethyl phenol, all of which leak into aquatic environments. Kehkashan Basu, founder of Green Hope Foundation that conducts several beach and park cleanups with the help of the municipality, said that till date they have collected thousands of cigarette butts. "On an average, each beach cleanup yields at least 5000+ cigarette stubs," she told Khaleej Times. "The quantity looks alarming, especially given the fact that Dubai is such a clean city. Yet when people visit beaches, many of them do not take the effort to disposing the stubs in the numerous trash bins along the beach." She said that the issue was present in other countries as well. "The Green Hope team conducted a beach cleanup recently along the shores of Lake Ontario in Canada and we collected several thousand cigarette stubs there as well." An official said that the ministry was taking all steps to safeguard the health of residents. 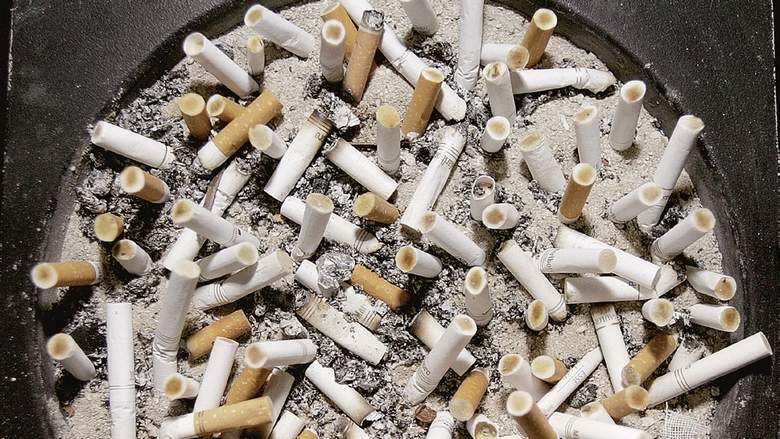 "Health authorities have taken this initiative of fining those who throw away cigarette butts for a long time and the municipality is already issuing fines," said Dr Wedad Al Maidoor, director of the national tobacco control. "We have also banned shisha on the beaches and in parks because it is a fire hazard," she said. According to Dr Wedad, small regulations in the National Anti-Tobacco Law are going a long way in protecting health of residents. "People can still get affected by the 'heavy metal' that lingers in second and third hand smoke which sticks to objects where a person has been smoking earlier." The toxicity of discarded filters is not the only concern. The plastic from tossed tobacco packaging and cigarette lighters also taints the planet's water sources, causing marine animals such as sea turtles to choke and starve, points the UNDP report. Smoking, including second-hand smoke, kills more than seven million people each year, most in the prime of their lives. Up to 10 billion of the 15 billion cigarettes sold daily are disposed in the environment. Cigarette butts account for 30-40 per cent of all items collected in coastal and urban clean-ups.